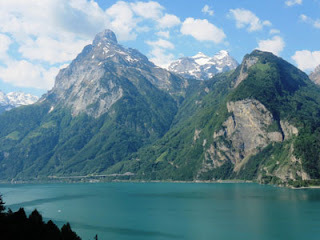 Turquoise glacial lakes, snow-covered mountains, and green hillside pastures kept our eyes fixated on the landscape during the drive from Wadensvil, Switzerland to Bellagio on Lake Como, Italy. One stunning scene after another captured our fancy during the six-hour drive. Well, we took that long because there were so many pull-outs at which to stop and take pictures. Clear, blue skies in late May were picture-perfect as we drove through the countryside and small, traditional villages. White cumulus clouds staked their places in the sky, rarely moving and hanging like suspended caps above the mountain peaks. At a tiny bakery in one small town we stopped to inquire about 10-mile-long Gothard Tunnel. As the world's longest tunnel, it's a portion of the journey that’s best avoided, if possible. 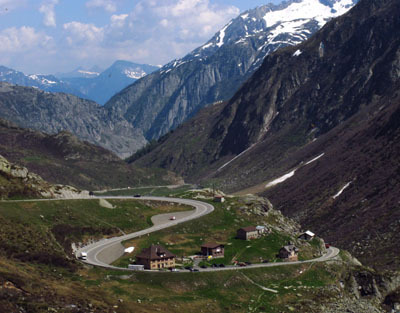 Luckily, Gothard Pass over the mountains was open, so we drove around the mountain at the tree line on a narrow, winding road. Patches of snow and ice, remnants from winter, melted into waterfalls and streams flowing from the mountain sides. Around noon, we stopped at a roadside pull-out. Surprised to find a makeshift café there, we bought bratwurst and brown bread to eat for lunch. It was really yummy, or maybe it tasted especially good because of our view from an outdoor picnic table--a magnificent panorama of the valley, mountains, and winding roads below. 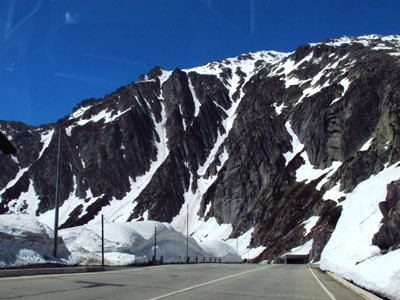 What a glorious sunny day we had for this drive—and we found ourselves enthralled by the gorgeous scenery--not to mention the skier coming off the mountain at the high point of Gothard Pass. Our drive continued through old Italian villages with streets barely wide enough for one vehicle let alone two (especially when the other was a tourist bus). Hubby narrowly avoided scraping paint off parked cars. At Mereggio we drove onto a ferry to cross Lake Como--and arrived at the village of Bellagio, "the pearl of Lake Como," our destination for the overnight visit. Once in picturesque Bellagio, finding our hotel, was not an easy task because of narrow, one-way streets filled with pedestrians. Eventually, we parked on a skinny street in a shopping area near a church, Piazza San Giacomo, location of St. James Basilica. (We learned all this when walking around town later). Shops lined the square: gelateria, café and sports bar (where a monastery used to be, we also find out later), pizza shop, hotel, high-end clothing stores, and art galleries. No, we didn’t see George Clooney. 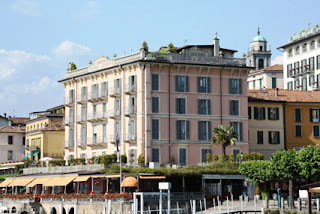 But we did find HotelMetropole, the oldest hotel in town, which overlooks the lake. Recently renovated (it’s non-smoking and even has a bathtub, but the elevator is a squeeze for three people), the charming pink building faces Prazza Mazzini, the market area by the water. This area, called “borgo,” is the town’s historic center and one of the first areas in Bellagio to be inhabited. It’s the area tourists visit most, with shops and galleries along the waterfront and for several blocks uphill. Towards evening we walked up the hill and window-shopped, admiring silk scarves and ties, leather handbags, shoes, exquisite clothing, wine, and souvenirs. Shopping is serious business in Bellagio, as evidenced by the book in our hotel room dedicated to shopping venues and best-buys. 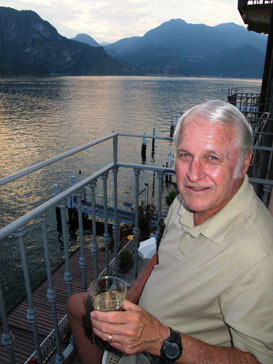 Our main purchase was a bottle of wine, and we enjoyed a sunset toast from our balcony overlooking the shimmering lake. 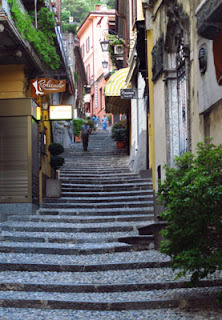 If you're longing for a peaceful, romantic setting, Lake Como doesn't disappoint.